The Cast Of "Ghostwriter": Where Are They Now? The Fort Greene, Brooklyn, bunch that rocked PBS has come a long way since their days wearing flair pens and solving mysteries at Zora Neale Hurston Middle School. Playing the free-spirited latchkey kid Lenni who lived with her musician dad in a loft, Berdahl/Lenni also made the best music video you'd ever seen. IRL, Berdahl graduated from Bucknell University in 2002 with a double major in economics and poli sci. Her LinkedIn page lists her as a "voice-over actress and announcer." She got married in 2007. Other than having the Best Name Ever, Sheldon, now 34, appears to have dropped off the radar entirely. Even though he totally cracked the case of the THABTOs onscreen, his Wikipedia page is bare, and there's a rumor he attended NYU in 2002. Maybe he's still embarrassed from wearing this outfit on national television. After graduating from (yep) NYU in 2003, Gaby hung up her pen necklace for good and joined the band The Pimps of Joytime. Lopez played the cute detective-novel reading brother of Gaby, whose parents owned a bodega. He was born in Queens and raised in Colombia, and he was rumored to be attending Rutgers University, although according to this photo posted on the Internet, he might be working as a waiter. Now 33, Tran graduated from Penn State in 2001 with a finance degree and seems to have kicked the acting habit for good, although she appeared briefly on a 2004 Lifetime show called Wild Card. William appeared as part of the cast of The Real World: Philadelphia in 2004. He left home at the age of 15 because his religious parents didn't approve of his being gay. He's currently an actor and personal shopper. Lowery has also appeared on Law & Order and The Cosby Show, but now she's perhaps best known for portraying Donovan McNabb's mother in those Campbell's Chunky Soup commercials. He graduated from New York University in 2002 and is currently working behind the camera as a writer and director. It was SLJ who spoke the very first words of Ghostwriter's pilot episode. He's picked up one or two roles since then. In 1993, Stiles played a computer hacking cyberpunk who famously asked Tina, "Can you jam with the console cowboys in cyberspace?" Future MTV VJ Daisy played Galaxy Girl, the action hero of Gaby's favorite TV show, who makes a cameo in one episode in a definitely '90s superhero outfit. 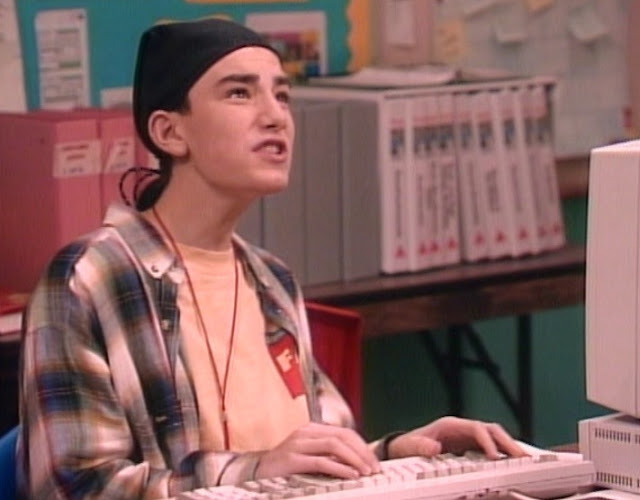 While the other cast members seem to have focused on college and their personal lives, Ghostwriter became mired down in a sordid lifestyle of cute girls, spending all his cash and indulging in too many after-school Capri Suns. He briefly filled in as an understudy for Alex Mack's puddle before retiring to the Bahamas. Gooey Gus spit purple slime at kids and was definitely THE SCARIEST THING ABOUT YOUR CHILDHOOD.